The History of Bladen-Gaskins Funeral Home and Cremation Services: Gaskins Funeral Home opened its doors in Bladen County in September 2001. 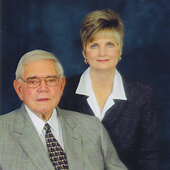 Harvey and Linda Gaskins had been in the funeral business for most of their adult lives. Linda, being from Bladen County, had a great love for the people of Bladen County and the surrounding areas. They decided to "come home" to Bladen County and opened the then closed Carter Funeral home in Clarkton and renamed it Gaskins Funeral Home. As the business grew and more families chose Gaskins Funeral Home, expansion was evident. Wanting to provide a quality funeral home that was more centrally located for the people of Bladen County and the surrounding areas, the dream of Bladen Funeral Home and Cremation Services was born. In October 2004, while keeping Gaskins Funeral Home open in Clarkton, Bladen Funeral Home and Cremation Services began operation in Elizabethtown. In 2008, the two facilities were combined and became Bladen-Gaskins Funeral Home. It's location at the corner of Hwy 242 and Martin Luther King Drive is very centrally located. The beautiful building has a large chapel, two large viewing rooms, a large arrangement and selection room, and a huge parking area. Today Linda, through Bladen-Gaskins Funeral Home and Cremation Services in Elizabethtown, along with her experienced staff, make sure that their goal of giving quality service at affordable prices and satisfying the needs of the families with utmost dignity is met. Using our video technology, families who wish to do so may have a video tribute of their loved one playing during the visitation. The services offered by Bladen Funeral Home and Cremation Services are more meaningful and incorporate the latest developments to offer every family the unforgettable personalization they deserve.